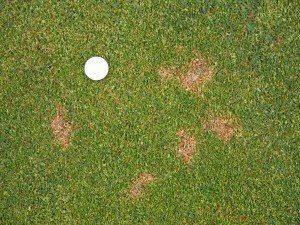 Dollar spot is characterized by round, bleached-out or straw-colored spots, ranging from the size of a quarter to the size of a silver dollar. Spots appear as sunken areas in the turf, especially low mown turfgrass (0.5 inches or less). Fluffy white mycelia can be seen when fungus is actively growing during morning periods of heavy dew. Symptoms on individual grass blades appear as bleached-out or tan lesions that are often accompanied by reddish brown bands present at the outer edge of the leaf lesion (except on annual bluegrass). This disease affects lawns during heavy dew periods that are low in nitrogen and stressed by drought. Dollar spot occurs when daytime temperatures are between 59-88° F (15-31° C) and disease development is favored by warm, humid weather followed by cool nights that produce heavy dews. Typically, dollar spot can be corrected with a fertilizer treatment by maintaining adequate nitrogen and potassium fertility, watering deeply when necessary and removing excess thatch. If your grass is prone to dollar spot, remove morning dew by dragging a hose across the lawn.